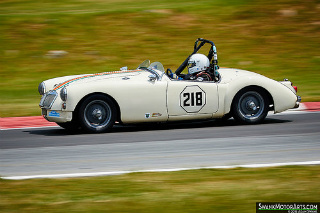 1959 MGA This gorgeous classic was driven by Dave Good during a Group 5 Race at the 2015 Jefferson 500. A 1.6 litre Mark 2 had a top of 101 mph and 0-60 in 13.7 secs. A sight to behold! 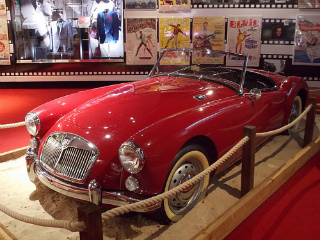 The MGA 1600 sports car. By 1959, having been in production for four years, the MGA 1500 needed an uplift, in terms of performance, to keep it competitive. Therefore, in 1960, the MGA 1600 was introduced as a two door, two seater convertible and fixed head coupe. 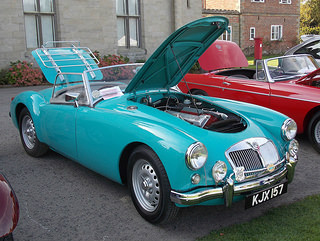 Externally, the basic design was very similar to that of the MGA 1500. 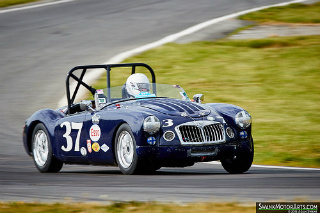 However, the capacity of the BMC B-Series, overhead valve engine was increased from 1489 to 1588 cc, the same as that used in the MGA Twin Cam roadster, introduced in 1958. It had a compression ratio of 8.3:1. The 99 cc increase in capacity caused the power to rise by an additional 6 bhp to 78 bhp whilst, at the same time, there was a 17 % increase in torque. This gave rise to a marked improvement in acceleration, whilst the top speed passed the very important 100 mph mark. It continued to use two SU carburettors and a four speed gearbox with synchromesh on the top three gears. 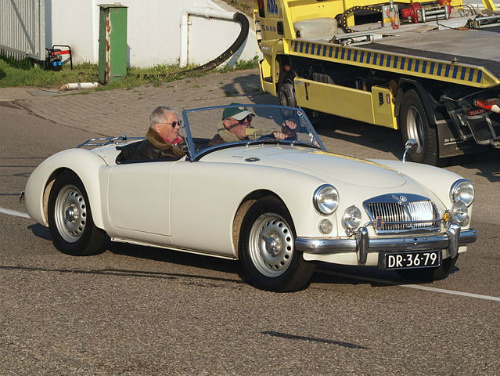 Near the end of production of the MGA 1600, an unexpected option became available. 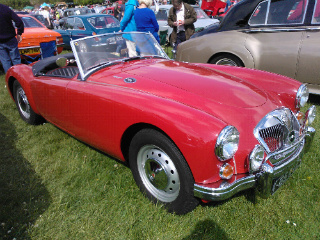 Some of the MGA Twin Cam chassis and special wheels, left over when this model was discontinued, were used with the MGA 1600 bodies and drive trains. As a result, this facilitated the addition of disc brakes on all four wheels. 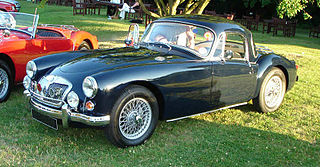 This variant became known as the MGA 1600 De Luxe. It has been estimated that 400-500 of these De Luxe models were built, and were identified by the "De Luxe" badges once again on the boot and near the front air vents. Once again, in order to maintain momentum, in 1960, the MGA 1600 Mark 2 sports car was introduced. In this model, the engine was bored out from 1588 to 1622 cc, the cylinder head was modified with larger valves, and the combustion chambers were redesigned. The back axle ratio was also increased to 4:1 to create more relaxed long distance and high speed driving. In total, 8,198 MGA 1600 Mark 2 convertibles, and 521 fixed head coupes were built. Following on from the De Luxe models, there were 290 MGA 1600 Mark 2 De Luxe convertibles and 23 Mark 2 De Luxe fixed head coupes built. A 1959-62 MGA 1600 in good condition would fetch between £11,000/$18,000 to £18,000/$29,000, whilst an example in excellent condition would command up to £32,000/$51,000.